Ledge stone is made up of a variety of irregular shapes and sizes and roughly textured to create its rugged appeal. This versatile pattern will create a dramatic impression on the interior or exterior of your next project. This profile was created using a unique blend of natural stones. Ledge stone can also be blended with field stone to create an old-style rustic look. 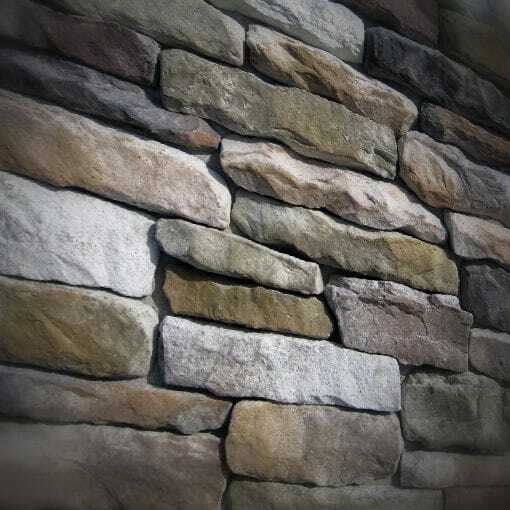 Ledge stone is a stone veneer product measuring 1" to 2" thick and therefore thinner than traditional stone siding for easier, lighter handling. All our manufactured stone veneer products are suitable for interior applications such as stone accent walls or stone fireplaces as well as exterior applications such as stone veneer siding. Ledge stone is available in boxes of 10 square foot flats, boxes of 7.5 lineal foot matching corners, 150 square foot bulk crates, and samples are also available! Short side: 3" to 4"
Long side: 10" to 12"
Premium Manufacturing: To ensure you get the best stone veneer, Mountain View Stone strictly monitors every step of the production process for quality control. Enduring Appearance: Made with Color Lock Technology, the face color has bonding agents in it to help protect against fading from harsh environmental conditions, cleaners, and even pressure washing (see installation and maintenance documents for more information). Application Options: Suitable for interior and exterior installations, you can put stone veneer everywhere from the outside of your house to your living room. No Sweat Installation: Grooves raked onto the back of every stone to provide a sure grip to the wall and a quick installation. Post-Purchase Support: Backed by a 50 year limited warranty, an excellent long-term investment for your home. Made In America: High quality stone veneer made in the USA.